Why delay weaning? Why extended breastfeeding? While more people are initiating breastfeeding at birth now, only a small percentage make it to six months, let alone to a year. Breastfeeding beyond six months and especially past the first year often incites negative comments from family, friends and strangers. Some think that there are no benefits to nursing beyond a year, but they are wrong. 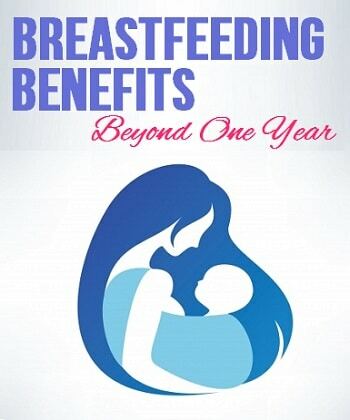 There are many breastfeeding benefits beyond one year for you and your baby. • The average age worldwide for weaning is 4.2 years old! • The World Health Organization (WHO) suggests that babies and toddlers be breastfed for a minimum of two years, and as long after that as is mutually accepted. • Extended breastfeeding is considered beneficial and recommended by the World Health Organization and the American Academy of Family Physicians. • While many people will tell you that a child doesn’t get anything out of breast milk after six month or a year, that is untrue. Toddlers get energy, protein, calcium, essential fatty acids, vitamins A, B12 and C from breast milk. They also get 76% of their folate requirements from nursing. • Breastfeeding beyond the age of one protects the toddler from illness. Studies are showing that toddlers who nurse between the ages of 16 and 30 months have fewer illnesses, and those they do get it ill, it lasts a shorter period of time. • When a child develops an illness like diarrhea or fever, the appetite usually decreases. Children in these circumstances are still willing to nurse, preventing dehydration and providing nutrition during the course of the illness. • Toddlers who nurse develop fewer allergies and cases of asthma. • Nursing toddlers do better in school later. Breastfeeding builds the brain. • Toddlers that breastfeed make better adjusted children. Their needs are met physically and emotionally through breastfeeding and the close relationship between mom and child. They develop their sense of independence secure in who they are. • While short-term breastfeeding offers some protection for children from leukemia, sustained breastfeeding gives them an even greater reduced risk. The longer a woman breastfeeds, the more protection she has from breast cancer. Studies show a distinct correlation between how many years are spent breastfeeding and increasing protection from breast cancer. • Extended breastfeeding reduces the chances of developing ovarian cancer. • Breastfeeding reduces the chances of developing uterine cancer. • Breastfeeding reduces the chances of developing endometrial cancer. • Breastfeeding reduces the chances of developing rheumatoid arthritis. • Breastfeeding helps moms lose weight with less effort. • Breastfeeding helps protect women from osteoporosis. While nursing, a mother may lose 1 to 2% of bone density. This loss is gained back after weaning, often to the mother’s benefit as an increased amount is added to the bones than was lost. • Sustained breastfeeding delays fertility in many women by suppressing ovulation.